About 6,200 are considered to be homeless in the city, which includes about 900 people who are unsheltered. Homelessness is caused by poverty, lack of money to afford a place to live and food to eat. Sometimes mental illness contributes. The Opioid crisis has caused many new people to become homeless. Homelessness in Center City is more visible now due to construction and fewer public spaces for people to live unnoticed. Kensington is another area with a high concentration of homelessness, but homelessness is a city-wide issue. Why are people walking around with suitcases and bags full of stuff? The City’s emergency housing programs provide storage for people’s belongings. In all likelihood the individual is not in one of our programs or they are more comfortable being surrounded by their possessions. Hoarding can be an indicator of mental illness, but part of the tragedy of homelessness is that people lose everything so they may naturally hold onto whatever little they have. Why don’t you just move people? It is not a crime to be homeless or to have a mental illness. We do not arrest people for being homeless. An arrest decreases their opportunities to become housed and raises the costs for the public sector. People who are homeless need a place to live and a helping hand. We are working to find a way to work with individuals experiencing homelessness, while protecting the rights of residents, businesses, and visitors. 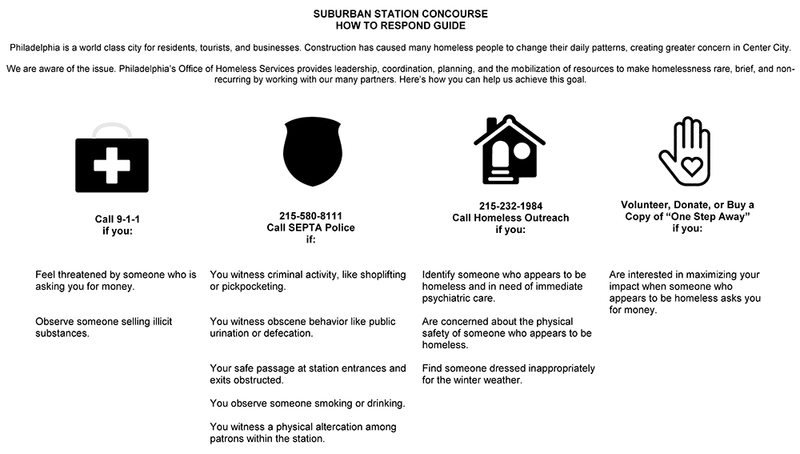 SEPTA, the City’s Office of Homeless Services and the Department of Behavioral Health and Intellectual disAbilities and the Philadelphia Police Department work together to coordinate homeless outreach, services, and enforcement.